Although the details have yet to be ironed out, Metro's Board of Directors is likely to adopt a mix of fare increases and service cuts in an effort to close a budget hole and shrink an expected larger deficit that will hit the transit agency next year. WASHINGTON — Facing a $125 million revenue shortfall, Metro Board members believe fare hikes are likely even if the details remain unclear. “I think it’s inevitable that at some point during FY18, Metro rail fares will go up,” Finance Committee Chair Michael Goldman said. He said bus fares would rise too, although he is still pushing for some type of discount for low-income bus riders. The Board expects to reach an agreement on service cuts and fare hikes for rail and bus service by late March. No changes would take affect until at least July, when the new budget year begins. “It’s not a very significant or unbearable increase at this time. But I do think that, in light of what riders have been exposed to over the past year … if we can put that off a little bit and create some running room before fare increases take effect, that’d be the better policy,” Goldman said. Evans has asked the committee to postpone its decision on the budget until March 23, because he will be out of town and will miss a March 9 meeting. He acknowledged fears of a “death spiral” for Metro. And he said that fare hikes and service cuts are “counterproductive to what we’re trying to do.” But he said that Metro needs to start laying the groundwork for a regional solution to what is predicted to be a dire budget situation next year. For now, Metro is trying to close a $75 million gap through the end of June. Chief Financial Officer Dennis Anosike said the shortfall could be covered through a variety of changes including delaying more than $20 million in spending, a freeze on travel and the completion of property sales. Anosike and General Manager Paul Wiedefeld assured the board that the estimates for the coming year do take that into account. The downward trend is not new, with Metro down an average of more than 100,000 riders each weekday since a 2009 peak. Wiedefeld said if all of those riders returned, Metro would take in more than $100 million in additional revenue. His budget proposal for the year starting in July was based on what he said was a $290 million budget gap. “If every rider came back that we lost in the last eight years, we are still way short of where we need to be beginning in ’19,” Evans said. “What do we do with this thing if the riders don’t come back?” Evans said. 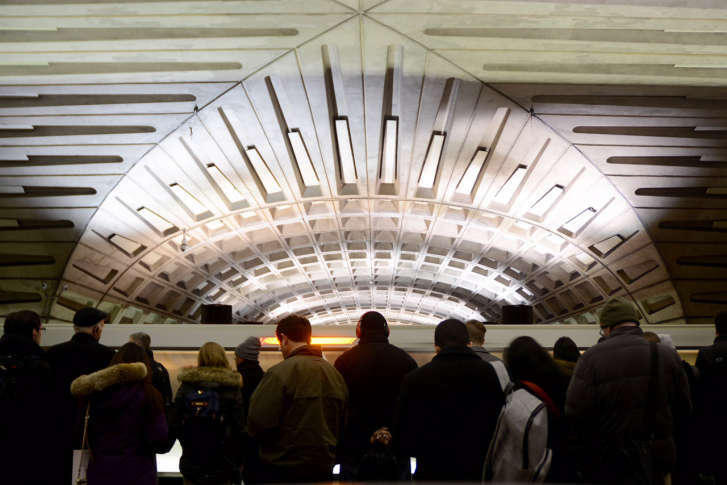 Board Member Tom Bulger, who represents D.C., suggested that the agency is scraping the bottom of the barrel on fiscal ideas, and should consider joining other cities who have sold the names of stations to advertisers. Goldman said Metro staff are again looking into that idea as part of discussion to expand advertising income. “This system is not failing because we’re losing riders. This system is failing because from the beginning it never had enough money to be run properly,” Evans said. Past Metro leaders have ignored or neglected basic safety and repair needs. Metro now promises that its accelerated track work program dubbed SafeTrack and other ongoing maintenance projects will make the system safer and more reliable, which leaders hope would draw more riders back even despite reduced service.